A consortium of companies, headed by Dutch camera company, Adimec, has won the 2009 Vision Award for the development of digital interface technology, CoaXPress. CoaXPress is capable of sending video, control and power at high speeds over conventional coaxial cable. It allows a camera to be connected to the host system using one standard coax cable. The award, sponsored by Imaging and Machine Vision Europe, was presented to members of the consortium at a prize-giving ceremony at machine vision trade fair Vision 2009 in Stuttgart on 3 November. 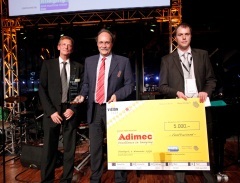 Jochem Herrmann, chief technology officer at Adimec, collected the €5,000 prize on behalf of the consortium, comprising: EqcoLogic, a Belgian company specialising in high performance communications devices; Active Silicon, a UK company specialising in frame grabbers and embedded systems; Components Express, a US-based cabling specialist; AVAL Data, a leading Japanese frame grabber company; and NED, a Japanese camera and frame grabber vendor with particular strength in line scan camera systems. CoaXPress works at distances of more than 100m, which is more than 10 times the range offered by Camera Link solutions. Data rates can go higher than Camera Link (Full) and it is designed to be a plug-and-play interface solution. The initial CoaXPress specification allows for a base configuration with 3.125Gbit/s image transmission from the camera; there is also a full configuration offering 6.25Gbit/s. For higher speeds, the full configuration can be implemented with two or more links, giving multiples of 6.25Gbit/s channel speeds. In all cases, the system supports up to 20Mbit/s control signalling and power transmission to the camera. The goal of the consortium was to develop the first draft of a CoaXPress specification and then transfer for standardisation. 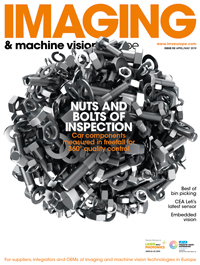 The Japan Industrial Imaging Association (JIIA) has agreed to host the standardisation, which the AIA and EMVA are also free to adopt through the G3 standards agreement. The interface will be an open standard. To date, four of the companies in the consortium have launched products that support the interface: Adimec's Opal camera family, EqcoLogic's transceiver products, the Phoenix-CXP frame grabber from Active Silicon, and a line of coaxial cabling from Components Express, making up all the components of a complete vision system.